Ruth Bancroft is a dry gardening pioneer. Her life long love of plants led to the creation of one of the most acclaimed public gardens, The Ruth Bancroft Garden in Walnut Creek, California. The Bold Dry Garden offers unparalleled access to the garden and the extraordinary woman responsible for it. In its stunningly photographed pages, you’ll discover the history of the garden and the design principles and plant palette that make it unique. Packed with growing and maintenance tips, profiles of signature plants for a dry garden, and innovative design techniques, The Bold Dry Garden has everything you need to create a garden that is lush, waterwise, and welcoming. 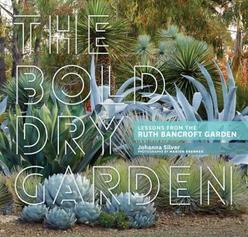 This stunning book shares the design principles that have made the Ruth Bancraft Garden an iconic American garden and shows readers how to create lush, low-water landscapes that thrive in arid conditions.